Jacques Cohen has been a regular conductor of Hertfordshire Philharmonia since 2000. Jacques read music at Oxford where he conducted the main university orchestra and performed several of his own compositions. When leaving Oxford, he was awarded the Conducting Scholarship at the Royal College of Music where he later won the Tagore Gold Medal, the College’s prize for its most outstanding student. Since then he has won several other awards including the August Manns Conducting Prize and the Constant and Kit Lambert Award. He took First Prize in the British Reserve Conducting Competition and was also a prize winner in the Leeds Conductors’ Competition. He then went on to work as Assistant Conductor to the London Symphony Orchestra and later with the Royal Philharmonic and worked closely with Michael Tilson Thomas, Sir Neville Marriner, Vernon Handley and Oliver Knussen. He has conducted a highly successful series of concerts in Bucharest with Romania’s premier orchestra, the George Enescu Philharmonic and has guest conducted orchestras throughout Europe and the UK. He was for a period Principal Guest Conductor of the Bombay Orchestra in India and is currently Principal Conductor of the Aylesbury Orchestra and Lloyd’s Choir. He has also been Musical Director of several major opera productions and was appointed as Music Director of the NPO in 2001. He has recorded CD’s for a variety of labels and broadcasts for radio and television. 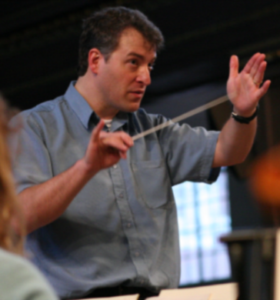 He is also Visiting Professor of Conducting at the Royal and Trinity Colleges of Music. Jacques conducts an extremely wide repertoire from Monteverdi to the present day and is a passionate advocate of music by living composers. He is also an enthusiastic communicator and has a growing reputation for his ability to explain music in an entertaining way and get audiences more involved in concerts. His many compositions include Quiet Music, which is regularly performed by British and American orchestras;Three Nottingham Dances, commissioned by the NPO and performed to great acclaim; a Tuba Concerto; a one-act opera, Magic Potions; and several award winning works for choir including his dramatic setting of Blake’s Songs of Innocence and Experience. His Fantasias, Canons & Fugues and the prize winning Elegy on a Floating Chord have been performed many times in Europe and on both sides of the Atlantic.